Rothbury, Northumberland. A name of a market town not far from Tarset which has been the focus of media attention for the past week. To Shep Rothbury holds many fond memories due to the fact that prior to 2001 it was home to one of the main auction marts for hill sheep. Sheep would travel from the Coquet, Breamish, College valleys as well as the Rede and North Tyne to be sold at Rothbury Mart. Rothbury alongside Bellingham Mart was one of the mainstays for traditional hill sheep. Shep well remembers heading for Rothbury Mart (twenty seven years ago this back end)for the very first time. It was a magical place lying down a steep bank with the River Coquet running at the back of the pens. The river could be crossed on a good day by stepping stones as a short cut up into the town, a town which boasted a shoe shop where good old herds boots could still be purchased, also a hardware shop where everything from fire grates to clothes pegs, pick handles to dog whistles could be acquired. The draft ewe sale at Rothbury Mart was a sociable day, held the same week as the sale at Bellingham it always meant two days away to the marts that week as you wouldn't like to miss anything. We had no warning that the mart would close down. 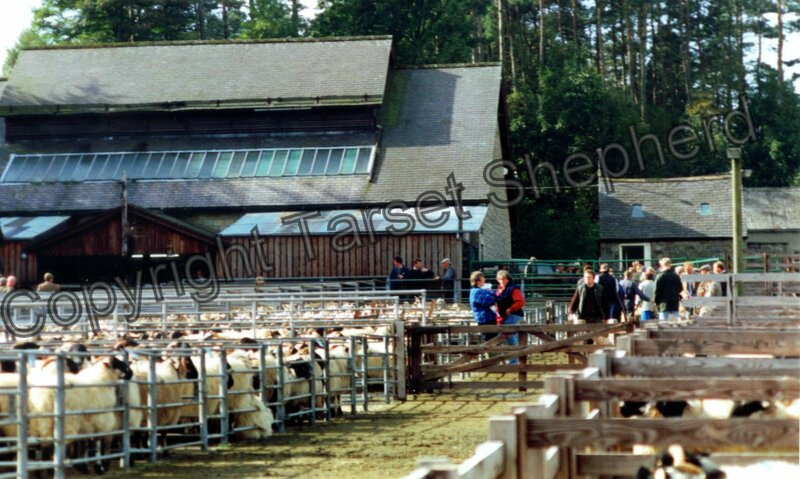 The foot and mouth outbreak of 2001 saw many changes to farming and the traditions, Rothbury Mart was one of these and no longer do the pens echo with the sounds of sheep and cattle, men and dogs. 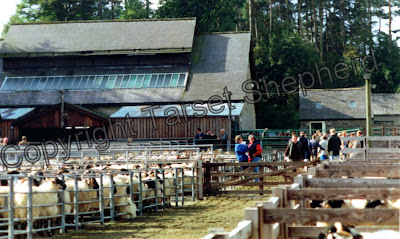 From that first visit to Rothbury Mart on the ewe sale day Shep was to be seen there every year until it's demise. The ring at Rothbury was a sight to behold when filled with large flocks of draft ewes from the out-bye farms, it wasn't unheard of to have many entries of 100+ sheep going through the ring at once, often put under the hammer as 'sold to cut', allowing the buyer to choose to buy as many as he wished. For instance is 150 were in the ring at one go and the buyer only wished to have sixty then on the drop of the gavel he would let it be known he only required sixty of the beasts, these would be the first sixty to run out of the ring, the remaining ninety would be put up for sale again, hopefully at the price already offered for them and often for a pound or two more. It was often said the first cut was the best, mainly because it was thought these were the fittest and liveliest ones which would just about knock the gate man over in their haste to get out of the ring. The 'last losser' would be given the opportunity by the auctioneer to stand by his last bid to resume the bidding on the sheep, if he was lucky no one else would 'come in' and bid against him. Shep's first outing to Rothbury Mart was not without incident. Being the new kid on the block I found it quite daunting. After one or two questioning "Wae's that then?" "Nivver seen hor around afore" it seemed that everyone knew my breeding, full life history and quite probably my vital statistics as well, where as I knew hardly a soul, many were fresh faces to me as I was well away from my home patch having only just taken up a shepherding post in the area, I could hardly remember who was Jock or Willie, let alone where they came from and spent most of the day feeling slightly awkward and most probably either grinning or scowling at everyone. My discomfort wasn't helped by the fact we had to eat. Tradition has it that your boss takes you for dinner, you're his employ and he feeds you. Fine by me. And so we headed to the bait cabin (canteen to posh folks). The bait cabin was a tin hut, with earthern floor, rickletty tables and forms (benches) or the odd chair to sit on. The menu was pie and peas or.... pie and peas. I thought it wise to request pie and peas. I detest mushy peas! In fact I detest them with a vengeance. However I was prepared to hold my nose and get them down, not liking to lose face over something quite so churlish as what seemed like a plate full of mushy peas which were obviously hiding the pie. If only life could have been so simple, maybe it was some sort of inauguration ritual, I really don't know but I soon learnt to laugh at myself. Boss and I sat down at a table with our luke warm plates of pie and peas. I had taken the end of a form whilst the boss sat opposite. A crack (conversation) ensued with the farmer on the other end of the form to me, I couldn't recall whether he was a Willie or a Jock, Tom or a Bob but not to worry my boss knew him well and the crack flowed whilst I looked at my quickly cooling plate and braced myself to commence dining. I had managed a couple of mouthfuls of the green goo when I rested my elbow on the table - bad idea! The table must have been three legged, either that or the earth floor was terribly uneven, my plate was heading for my lap. As I frantically tried to prevent it from reaching it's destination there was a cheery "I'm off then" from the other end of the form as the farmer rose to leave. Oh, Oh........ life took a downwards spiral, as did the plate full of green goo. Ever been on a see saw? The effect of the farmer standing up saw his side of the form rise upwards as mine tipped away downwards, along with myself, my plate and my pride. Guess that's one way to get out of eating pie and peas, just wear them instead! I turned down my bosses kind offer of another plate full whilst trying desperately to scrape the offending mess off my jeans and boots. It was a strong learning curve - never sit on the end of a form! As said at the off set, Rothbury holds many warm memories another date in the farming calendar now lost, another tradition gone but the memories hold strong.